Although there are a large selection of sound cards on the market they all lack key features needed for test and measurement applications. 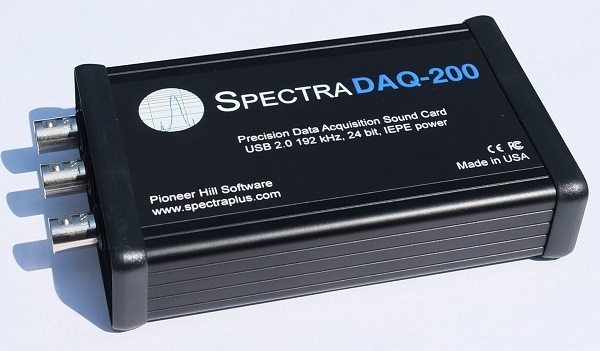 Our SpectraDAQ-200 module was custom designed for use with SpectraPLUS-RT and SpectraPLUS-SC. 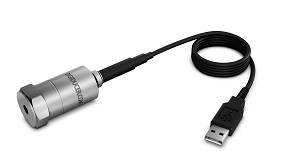 It uses the highest quality data converters for exceptionally low noise and distortion, has fixed gain steps for easy calibration to your transducer sensitivity, IEPE power for accelerometers or microphones, and incorporates standard BNC connectors widely used in test environments. For two channel acoustic and vibration signal measurements - this device does it all! This microphone is powered by a 4ma constant current power source (IEPE/ICP/CCP) such as is provided by the SpectraDAQ-200, Data Translation DT9837A and others. This microphone calibrator is compatible with both of the microphones listed above and others that have a 1/4" diameter capsule. The Digiducer is a precision accelerometer with an internal digital data acquisition circuit. It works directly with SpectraPLUS-RT and SpectraPLUS-SC for making reliable and accurate vibration measurements. A data acquisition module is not required.